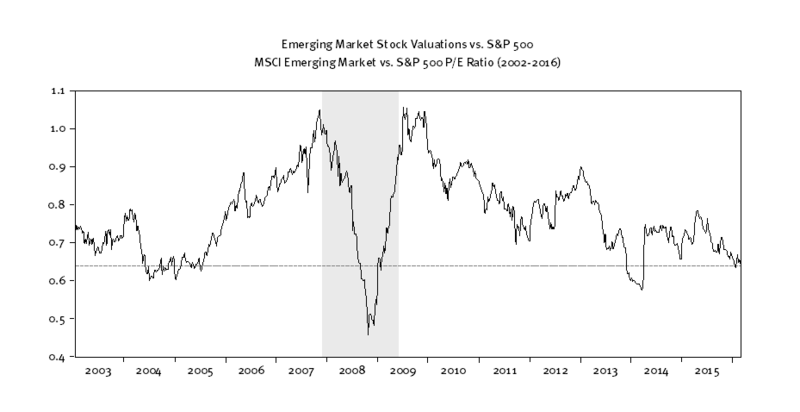 It is not very often that emerging market equities trade with valuations this low compared to the S&P 500. Typically, emerging markets trade with a lower multiple than developed given greater risks. Yet, there have been few times over the last twelve years when emerging markets were valued this low on a price-to-earnings ratio basis compared with the United States. Lower relative valuations reflect a variety of concerns including commodity prices, credit quality, currency, and growth. All of these are valid things to be concerned about and we’ve written about them before. Still, we have seen emerging markets underperform their developed market counterparts for five straight years. To a much greater extent, these concerns are being recognized and are priced into markets now than in the past. There were only three instances since 2002 when the MSCI Emerging Markets index traded at a lower relative multiple compared to the S&P 500 (chart below). Those moments included 2004-2005 (following Argentina’s last debt crisis), 2008-2009 (during the global financial crisis and recession), and in 2014 (when commodity prices first started to come under pressure). Following 2004, the emerging markets returned 132% over the ensuing three years versus the S&P 500’s 28% return. Following 2008, the emerging markets returned 60% over the next three years versus a 49% return for the S&P 500. So far, however, the return post 2014 has been poor. The emerging markets are down 22% since the end of 2014 versus a much more modest 3% decline for the S&P 500. Much of the concern stems from issues at the sovereign level, and currency devaluation across much of the emerging market world (relative to the U.S. dollar) has had a major impact on these economies. In many cases, the exchange value of emerging market currencies into dollars have been cut by 50% or more. Brazil’s currency, the Real, has fallen by 60% from its peak back in 2011. Interest rates have been doubled to 14.25% from 7.25% to help reign in inflation and stabilize the currency, but the economy has suffered. Investment and imports are both down 14% for 2015, and the economy is expected to contract by nearly 4% for the full year. 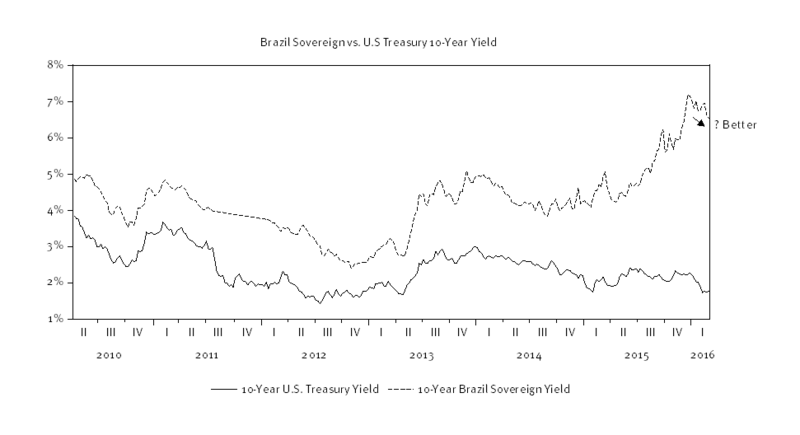 As a consequence, investor interest in Brazil’s sovereign debt has waned as credit concerns have grown. Credit default swap spreads widened from about 150 bps to over 500 bps, roughly in step with the widening of Brazil’s sovereign 10-year bond yield spread versus the U.S. Treasury 10-year yield (chart below). This widened spread represents both risk and potentially opportunity should spreads narrow over the longer-term. Accordingly, we believe that the deeper discounts for emerging markets is at least half of the equation. Worries about growth, commodities, credit, and currency were nowhere to be seen back in 2010 when enthusiasm was running high for emerging markets. Today, expectations have been dramatically reduced. 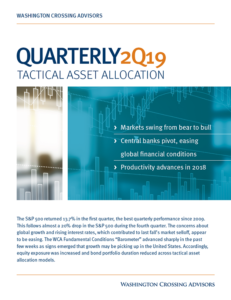 And while there may still be some turbulence yet ahead, the reset in expectations and valuations warrants at least a small allocation for investors with a longer-term point of view. 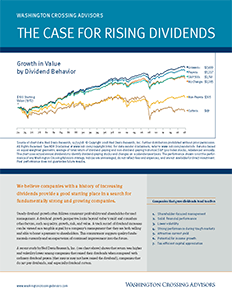 Last week, portfolio allocation weights have been brought up to a neutral weight on improved valuation and improved return potential from today’s starting valuations. The MSCI Emerging Markets Index is a free float-adjusted market capitalization-weighted index that is designed to measure the equity market performance of emerging markets.